So what makes a good app for a watch? One definition is an app you can glance at or interact with quickly to give you a snippet of information. Enter Jacob T.'s Daily Fruit. It syncs up with a web service occasionally to get a picture of a fruit for the day. What will today's Daily Fruit be? The app's icon in the carousel is sure to arouse your curiosity every time you sweep by it. 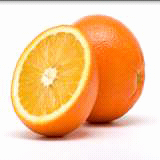 Swipe down and discover that today's Daily Fruit is an orange. Fortunately these days with the existence of Florida and free trade with South America, we can have nice oranges year round. So today, this will be a reminder to pick up a bag from the grocery store. Some days, though, the Daily Fruit will disappoint you. Like the other day, it appeared to be a field mouse. Turns out, it was actually the grape being held by the field mouse. Fortunately, if you need more than a daily fix of Daily Fruit, the app has settings. Swipe right to left to get to them. I'm not sure how to get in touch with the developer, Jacob T., other than posting on his Daily Fruit thread on the WIMM forums. I give this app 4-½ Ms, an excellent rating. It could get 5 Ms by identifying the fruit and giving some basic facts about it, such as growing season, domestic source, imports, etc.